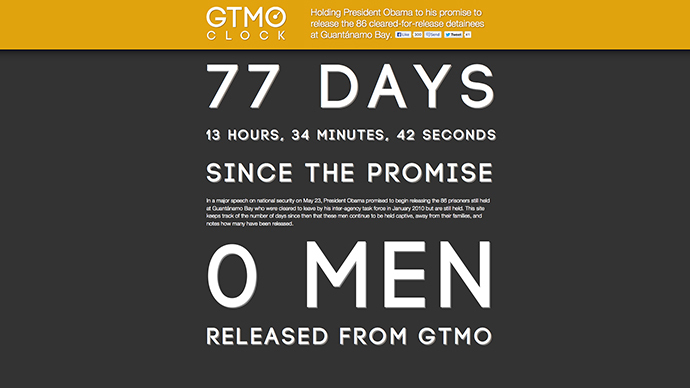 Activists calling for closure of Guantanamo Bay prison have launched an online clock, which counts the time since President Obama’s latest promise to set free inmates whom the US cleared for release. So far all of the 86 men remain incarcerated. The clock is a symbolic reminder of the fate of the 166 people who are currently kept in the controversial US facility. Dozens of detainees are continuing their so-far six-month hunger strike, a gesture of despair from the people, who have little hope to ever be free, says Andy Worthington, a human rights activist who has been advocating for Guantanamo prisoners for years. The promise to close Guantanamo prison was one of the key points of Barack Obama’s 2008 election campaign. One of his first moves as the president was an order to do so, yet the facility still remains active. The latest pledge from the president regarding Gitmo inmates came in a key security policy speech in May, which came in response to the concerns over the hunger strike voiced by some international bodies, including the UN, the EU and the International Committee of the Red Cross. Obama said that 86 inmates, who were cleared for release in January 2010 by the inter-agency Guantanamo Review Task Force, would be given freedom. The majority of those on the list – 56 – are Yemenis. The number of people released so far is 0. In the last three years seven prisoners have left Guantanamo. With a few exceptions, Guantanamo prisoners were never charged with any crimes or tried. Of the 80 inmates not cleared for release, 46 were recommended for indefinite detention without trial, because there was no sufficient evidence against them. The majority of those recommended for prosecution has not been put forward for trials, and are unlikely to be, according to General Mark Martins, the chief prosecutor of the military commissions. 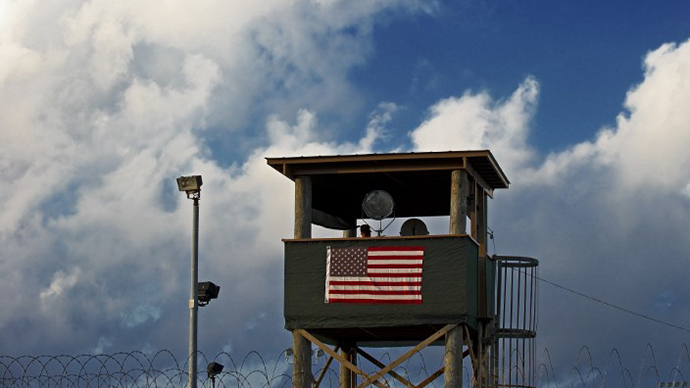 US lawmakers demand that the presidential administration certifies that any Guantanamo prisoner released would not be able to engage in any terrorist activities against the US. Worthington argues that such a certification is almost impossible to make. While Guantanamo inmates remain in legal limbo, a terrorist threat has returned to the frontline of the public discourse in the US this week. Washington issued a major alert and shut down dozens of its diplomatic outposts, mostly in the Middle East, Persian Gulf region and Africa. The US also evacuated non-essential staff from two facilities in Yemen and Pakistan, also warning its citizens that those countries are not safe for travel. The terror alert came after an intercepted Al-Qaeda communication indicating a major plot against America, US officials explained. Some skeptics voiced their doubts, saying that the threat may have been blown out of proportion and that the alert is being used to justify the massive surveillance methods used by the US National Security Agency. The existence of programs for dragnet collection of electronic data, which was made public by NSA whistleblower Edward Snowden, sparked a major scandal. The US maintains that the programs are lawful, efficient and morally justified methods to provide national security. Critics see it as a major violation of privacy.